Nowadays we are doing a lot of convening virtual-style. We've seen so much happen in a few short years with Facebook and numbers growing at such exponentially rapid rates it is almost impossible to imagine. People are tweeting and sharing millions of tweets a day, and a niche has been created in just one short year for books that offer guidance on Social Media marketing and etiquette. So, as we contemplate the platform and pace of Social Media and the many modalities of social networking, how might we apply the techniques of the Convening Wheel to assure our virtual engagements are as authentic as possible? Center: "At the Heart of The Matter". Core question: Who am I in relationship to others? Social Networking tips: What is my unique offering? What calls me to connect? How am I honoring others' virtual voices? if I'm marketing something, am I engaging the offering authentically as opposed to old-school force-marketing? 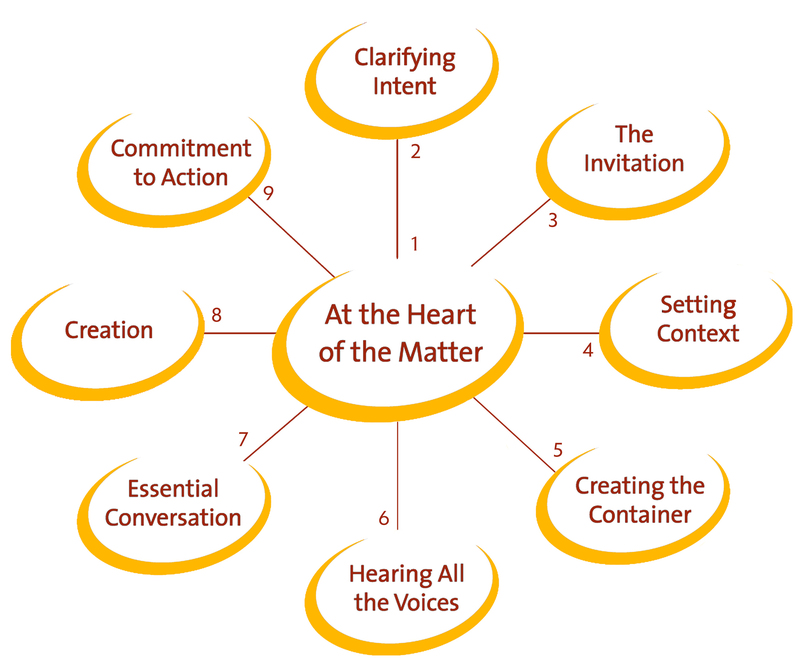 First "Spoke" or Aspect: Clarifying Intent Core question: are we aligned with our intention and purpose of engagement? Social Networking tip: be clear that your presence virtually is a two-way street of integrity, openness, honoring, and shared excitement of purpose. Be clear about your own personal values surrounding why you are present. Second "Spoke" or Aspect: The Invitation Core question: creating a sincere offering to engage that integrates purpose and intent. Social Networking tip: most people will know if you aren't authentic in your invitation--we humans tend to have 'spidey sense' for that sort of thing. So making it authentic, from your heart and truly meaning it--will inspire people to not only respond, but often say yes. Personal notes always lend a nice touch to social networking invites! Third "Spoke" or Aspect: Setting Context Core question: Communicating the form, function, and purpose of the engagement and intent. Social Networking tip: Be very clear as to the 'what is this about, and why it matters' of your offering--make it pertinent, cutting edge, catchy and most of all authentic to catch the eye of those who are getting deluged with invites, tweets, and mountains of other information daily in their inbox. Tell the story of why this is happening, or why it has become--offer ways to set the stage for why it's so important! Share pictures or videos. Add hotlinks to media and audio. we will cover the remaining 5 spokes on the wheel. Stay tuned! Thanks Craig. This is good stuff. Feels like we're on the verge of something very powerful with this new connectivity!